In this unit, we will look at the basics of Trigonometry, the study of triangles. We will consider different methods of determining information about triangles, the lengths of sides and their angles, and develop the skills that will enable us to choose an appropriate strategy based on the information we have. In this unit, we will consider the measurement of length area and volume. We will consider the different ways of measuring, and develop an understanding of their origins. We will tackle one of Mathematics' most useful tools- optimization- the process of maximizing one quantity given certain restraints in another. In this unit, we will gain some vital skills in data management. Perhaps the most important of those is the ability to analyse information, to spot patterns, and to be able to make predictions based on them. We will use tools that will help us process information and develop the skills that will enable us to analyse our findings. In this unit, we will look at various means of graphically representing relationships. We will consider different situations, and determine the form of graphical representation that would best illustrate the relationship. We will develop the skills to both produce and analyse such graphs. In this unit, we will look at ways of representing relationships using algebra. We will again look at a number of different relationships, and determine how they might best be described using the language of mathematics. We will use these representations to further study and develop the relationships. Mathematics becomes a critical life-skill when we apply it to our finances. We will look at various financial applications including annuities and mortgages, and gain the skills that will allow us to make educated and rational choices when faced with some of the biggest decisions we will ever make. In this unit, we will bring those skills into the personal budget, and look at the cost of living. We will consider savings plans, renting versus owning a home, and maintaining a budget. We will develop skills that everyone, regardless of their path thorough life, will need and use. 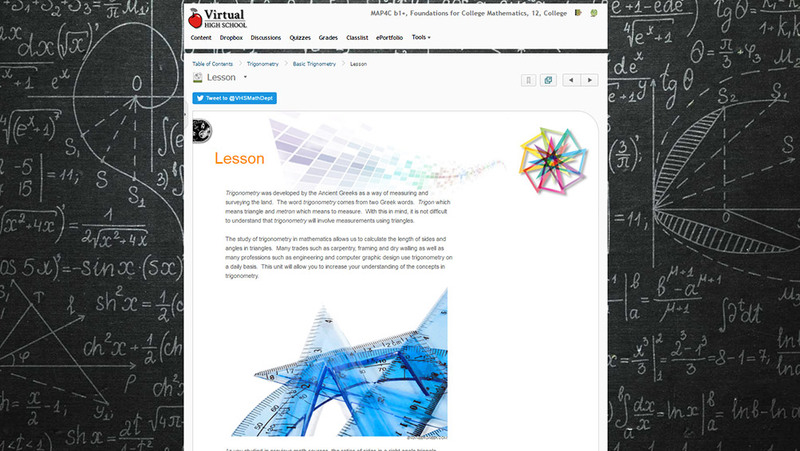 A3 make connections between formulas and linear, quadratic, and exponential relations, solve problems using formulas arising from real-world applications, and describe applications of mathematical modelling in various occupations. B3 design, justify, and adjust budgets for individuals and families described in case studies, and describe applications of the mathematics of personal finance. C3 solve problems using primary trigonometric ratios of acute and obtuse angles, the sine law, and the cosine law, including problems arising from real-world applications, and describe applications of trigonometry in various occupations. D2 demonstrate an understanding of the applications of data management used by the media and the advertising industry and in various occupations. Connecting: This course connects the concepts taught to real-world applications (e.g. concepts taught in personal finance are connected to purchasing a car, budgeting, and home ownership). Selecting Tools and Computational Strategies: This course models the use of graphing software to help solve problems and to familiarize students with technologies that can help make solving problems faster and more accurate. Students will also be introduced to software and other Internet resources that can help them to understand and manage their personal finance (e.g. mortgage calculator with an amortization schedule).